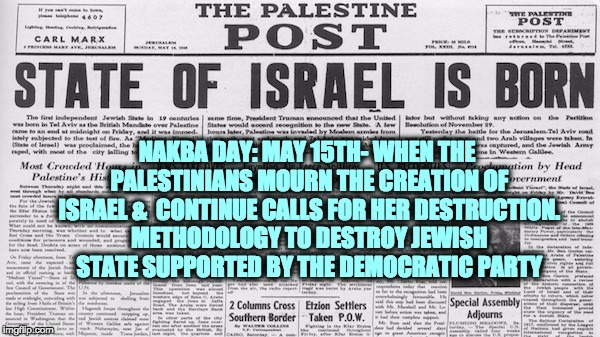 Nakba Day meaning “day of the catastrophe” is the day the Palestinians “mourn” the creation of Israel, the day after the anniversary of the creation of Israel in the secular calendar (May 15th). Truth be told, the day became a catastrophe for the Palestinian Arabs thanks to the nations of the Arab League. Today the refugees are the Arabs best strategy to destroy Israel, a strategy that was endorsed by the 2012 Democratic Party platform. Despite what the propagandists may say, the Palestinian refugee camps, were a catastrophe created by the Arab League and especially Egyptian President Nasser. Nasser figured out that it would make a great weapon against Israel (he was right). He knew that by forcing them into “camps” rather than allowing them to be absorbed by the countries they settled in, the Palestinians would remain the Arab Leagues best weapon against the Jewish State. Even though Israel offered the return of territories gained in the 1948 war, at the Rhodes armistice conference of February 1949, Arab leaders rejected Israel’s peace offers. Instead they declared jihad and condemned the Arab refugees to eternal refugee status. Instead the Arab nations occupied the remaining areas which the United Nations had envisioned as a Palestinian Arab state. Egypt herded Palestinian Arabs into refugee camps in its new fiefdom in the Gaza Strip, assassinated their leaders, and shot anyone who tried to leave. Jordan illegally annexed the West Bank and maintained martial law over it for the next nineteen years. Keep in mind that 60% of the Jordanian population is Palestinian Arab, the royal family are Hashamites who trace their lineage to what is now Saudi Arabia. In other words they have a heavy hand with the Palestinians because they are a foreign power ruling over the Palestinian Arabs. As the conflict with Israel hardened throughout the 1950s, Nasser came to see that Palestinian nationalism, if carefully manipulated, could be an asset instead of just a threat and an annoyance. Although the fedayeen terrorism prompted Israel to invade the Sinai in 1956, the Egyptian leader saw the value in being able to deploy a force that did his bidding but was not part of Egypt’s formal military; which could make tactical strikes and then disappear into the amorphous demography of the west Bank or the Gaza Strip, giving Egypt plausible deniability for the mayhem it had created. But Nasser’s ability to support such a useful terrorist group was limited by the failed economy over which he presided; and so, in 1964, he was delighted to cooperate with the Soviet Union in the creation of the Palestine Liberation Organization (PLO) which was led by an Egyptian, Yasser Arafat. While countries around the world are being urged to absorb millions of Muslim refugees today, in 1948 Egypt and Jordan were allowed to throw into refugee camps — the UN estimated the number as 711,000 refugees. At the time there was more than one “Middle East Refugee” problem. People forget there were 850,000 Jews in Arab nations that were thrown out of Arab countries. Perhaps that they were forgotten because Israel absorbed those refugees as part of her population. The Palestinian refugees are indeed part of the wedge preventing Arab Peace with Israel but not on the way one thinks. In 2012 it was estimated that there were approximately 30,000 of those 1948 Arab refugees still alive. But the UN estimated that the number of Palestinian refugees are over 5 million. That’s because while ignoring the Jewish refugees, the UN counts the original refugees, their children, grandchildren, first cousins twice removed on their mother’s side, friends from nursery bomb-making school, etc. as refugees. This is the only example in history where the number of refugees has grown without another population shift and just one more way that the United Nations is trying to destroy Israel. Usually the by the second generation people have been absorbed into their new homes, but the Arab countries have refused to allow the Palestinian refugees to become citizens of their new lands. Not so. Palestinian suffering is, of course, real and heart-wrenching, but what the Arab narrative deliberately distorts is the cause of its own tragedy: the folly of its own fanatical leadership — from Haj Amin al-Husseini, the grand mufti of Jerusalem (Nazi collaborator, who spent World War II in Berlin), to Egypt’s Gamal Abdel Nasser to Yasser Arafat to Hamas of today — that repeatedly chose war rather than compromise and conciliation. The reason the refugee issue remains today, is because they are the Arabs most potent weapon to destroy Israel, and they are receiving help the United Nations and sadly the Democratic Party in the U.S.
That is why the Palestinians have refused to recognize Israel as the Jewish State (which is how it was defined by the resolution creating Israel). And the Democratic Party agrees with Abbas. A plank in the Democratic Party platform requiring Palestinian refugees to be resettled in a Palestinian state rather than Israel was removed during the 2012 convention; unlike the Jerusalem provision it was never added back. Since they cannot defeat Israel militarily; one of the Palestinians strategies is to flood Democratic Israel with “refugees” so it will cease to exist as a Jewish state via election. That is why the 2008 and previous Democratic Party platforms included the refugee statement, and why as the party began to become more liberal/anti-Israel that plank was removed. In the end Nakba day is not about recognizing the Arab people displaced by Israel’s 1948 war of independence, there are only 30,000 left. Nakba day is about another approach to destroying the Jewish State of Israel, an approach the Democratic Party platform agrees with.